White Truffles are the most exquisite and sought after truffles in the truffle world. Most commonly known as the “White Alba Truffle”, these earthy gems are most famous for their complex earthy aroma and distinct unique flavor. White Truffles are meant to be only served fresh, where the heat of the prepared dish helps release the truffle’s natural pungency. Excellent shaved onto steak, risotto, fresh pasta or potatoes, there is no comparable experience to eating a white truffle. 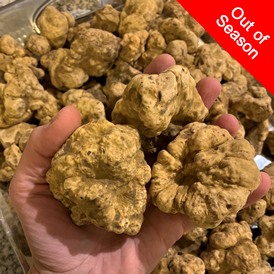 White Truffles are in season between the months of October through the end of December and their availability and price fluctuate as the season progresses. Fresh truffles are a highly perishable product and are intended to be used as soon as possible. Stored properly in the refrigerator truffles can last sometimes up to a week. We recommend you keep your truffles in your plastic container, individually wrapped in dry paper napkins. Make sure the container is properly sealed.  The paper towels used to wrap the truffles should be replaced daily until the truffles have been used. Burgundy Truffles, also known as the Black Fall Truffles are the most widely used truffles and are most famous for their earthy hazelnut flavor. Found in most of European countries, Burgundy truffles have a darker, rough skin with diamond-shaped points and have a coffee colored surface with white veins. Less pungent in flavor then the Winter Truffle (Perigord Truffle), Burgundy truffles still offer a unique flavor experience with a much smaller price tag. Enjoy your Burgundy Truffles freshly shaved over pasta, eggs, mashed potatoes or beef carpaccio. Burgundy Truffles are in season between the months of September through December and their availability and price fluctuate as the season progresses. Fresh truffles are a highly perishable product and are intended to be used as soon as possible. Stored properly in the refrigerator Burgundy truffles can last sometimes up to two weeks. We recommend you keep your truffles in your plastic container, individually wrapped in dry paper napkins. Make sure the container is properly sealed. The paper towels used to wrap the truffles should be replaced daily until the truffles have been used. 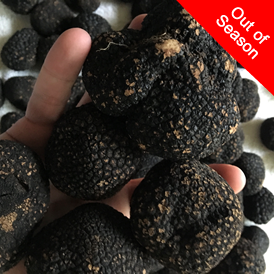 Summer Truffles start the truffle season and due to their black texture are commonly referred to as Black Summer truffles. Although summer truffles are not as intense in flavor as their more famous Burgundy cousin, they still offer plenty of exquisite flavor helping turn any dish from ordinary to extraordinary. Known for their earthy hazelnut, savory and sometimes even chocolatey flavor, summer truffles are a splendid addition to any pasta dish, risotto or protein dish. Summer Truffles are in season between the months of May through August and their availability and price fluctuate as the season progresses. Fresh truffles are a highly perishable product and are intended to be used as soon as possible. Stored properly in the refrigerator Summer truffles can last sometimes up to three weeks. We recommend you keep your truffles in your plastic container, individually wrapped in dry paper napkins. Make sure the container is properly sealed. The paper towels used to wrap the truffles should be replaced daily until the truffles have been used. Perigord Truffles, also known as the Black winter truffles are the second most sought after truffles and the most precious of all the black truffles. Known as the “Black Diamonds” of the Kitchen, Perigord truffles will enrapture your senses with their rich, deep aroma and pungent taste. 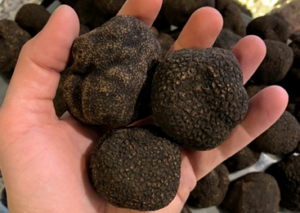 Tuber Melanosporum has dark, robustly veined flesh that appears black purplish when shaved thinly over a dish and their flavor and aroma is much more pungent than any other black truffle. Perigord Truffles pair excellent with any pasta, seafood or steak dishes. Remarkably, Perigord truffles can be enjoyed during the summer months as well due to their successful cultivation in Australia. 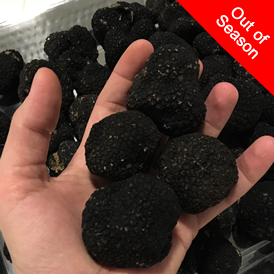 We are pleased to offer you the best of Black Winter truffles, whether they are of European or Australian origin. European Perigord Truffles are in season between the months of December through March. Australian Perigord Truffles are in season between the months of June through August. Their availability and price fluctuate as the season progresses. Fresh truffles are a highly perishable product and are intended to be used as soon as possible. Stored properly in the refrigerator Perigord truffles can last sometimes up to two weeks. We recommend you keep your truffles in your plastic container, individually wrapped in dry paper napkins. Make sure the container is properly sealed. The paper towels used to wrap the truffles should be replaced daily until the truffles have been used.